I can be very picky about the type of razor I use. I have very sensitive skin and constantly break out in razor burn. 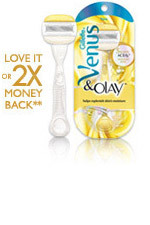 In the past I have really loved the Gillette Venus razor so when I heard the were making it with Olay I was so excited. Then I got my Love Vox Box from Influenster and was thrilled to find the Gillette Venus & Olay razor. This razor has Venus' five blades for a close shave plus Olay's moisture bars help lock in moisture to keep your skin from getting dry. The new Venus razor features a rounded, pivoting head designed especially for a women's curves. I think the best part is that all you have to do is wet the razor and you will have a light lather. You do not need to use any shaving cream. I received this product complimentary through Influenster's Love Vox Box.